At the core of every good company is a common purpose that aligns with the integrity and values upon which its foundation stands. Our noble purpose is the core belief of the company: “Trucking is a noble profession and truck drivers are noble people.” As we endeavor to create a noble trucking company, we are fueled by the purpose to serve and empower our community. Every member of the team should work toward that common goal. Claims Administrator Cathy Stockton is a wonderful example of the company’s mission to fulfill the noble purpose. For the last decade, Cathy has played a crucial role in helping our drivers with OSD (over, short and damaged) claims. With over two decades of experience in the transportation industry, Cathy manages a variety of responsibilities from aiding drivers on the road to verifying One Leasing’s insurance policies. No matter the issue, Cathy handles each call seamlessly with patience and efficiency. For Cathy, it all comes down to the simple question, “How would I feel if I was in this situation?” By being able to put herself in the driver’s shoes, it is easier for her to assess the situation calmly and proactively. “I take pride in the fact that my role makes an impact on our drivers every day. Time equals miles! 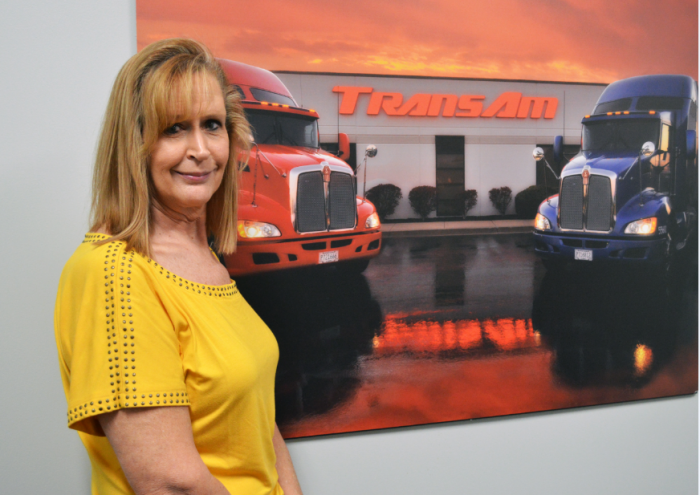 The more efficient I am at coordinating the OS&D claims, the more efficient it is for the drivers and they can get back on the road,” Cathy says. One of the aspects she enjoys in her multi-faceted role is coordinating the donations of OS&D goods to drop off at food banks, homeless shelters, and communities. Cathy gets joy from the fact that each donation makes a significant impact. “Many times when I have called a food bank to notify them of a load being dropped off for donation, they are so appreciative. You realize every donation matters. It’s supplying a number of meals for those in need,” says Cathy. It is team members like Cathy who set an example for the rest of us. Cathy not only takes pride in her role, but she also makes an active effort to uphold our noble purpose. Cathy advises, “Treat people with respect. TransAm believed in me and my capabilities. I truly believe that makes a difference. Most people will do better if they feel that they are being valued and respected.” Thank you, Cathy, for being a valuable part of our team. You are a true example of what it means to be noble.